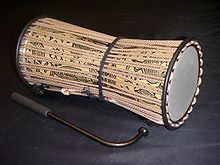 The drum is a member o the percussion group o muisical instruments. In the Hornbostel-Sachs clessification seestem, it is a membranophone. ↑ Grove, George (January 2001). Stanley Sadie, ed. The New Grove Encyclopædia of Music and Musicians (2nd ed.). Grove's Dictionaries of Music. pp. Volume 5, pp638–649. ISBN 1-56159-239-0. This page wis last eeditit on 13 Apryle 2017, at 03:24.